NCERT Exemplar Class 12 Chemistry is very important resource for students preparing for XII Board Examination. 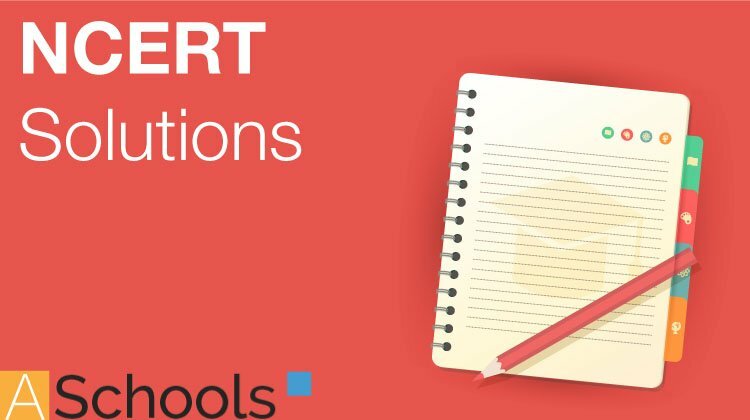 Here we have provided NCERT Exemplar Problems Solutions along with NCERT Exemplar Problems Class 12. Here you can get Class 12 Important Questions Chemistry based on NCERT Text book for Class XII. Chemistry Class 12 Important Questions are very helpful to score high marks in board exams. Here we have covered Important Questions on Haloalkanes and Haloarenes for Class 12 Chemistry subject. Chemistry Important Questions Class 12 are given below. The order of reactivity of following alcohols with halogen acids is ___________. Which of the following alcohols will yield the corresponding alkyl chloride on reaction with concentrated HCl at room temperature? Identify the compound Y in the following reaction. Which of the following is halogen exchange reaction? Which reagent will you use for the following reaction ? Arrange the following compounds in the increasing order of their densities. In which of the following molecules carbon atom marked with asterisk (*) is asymmetric? Which of the following is an example of vic-dihalide? The position of –Br in the compound in CH3CH == CHC (Br)(CH3)2 can be classified as ____________. Chlorobenzene is formed by reaction of chlorine with benzene in the presence of AlCl3. Which of the following species attacks the benzene ring in this reaction ? Ethylidene chloride is a/an ______________. What is ‘A’ in the following reaction? A primary alkyl halide would prefer to undergo _____________. Which of the following alkyl halides will undergo SN1 reaction most readily? What should be the correct IUPAC name for diethyl bromomethane? The reaction of toluene with chlorine in the presence of iron and in the absence of light yields ____________. Molecules whose mirror image is non superimposable over them are known as chiral. Which of the following molecules is chiral in nature? Reaction of C6H5CH2Br with aqueous sodium hydroxide follows ____________. Which of the following compounds will give racemic mixture on nucleophilic substitution by OH– ion? Which is the correct increasing order of boiling points of the following compounds? Note : In the following questions two or more options may be correct. Consider the following reaction and answer the questions no. 32–34. Which of the statements are correct about above reaction? (i) (a) and (e) both are nucleophiles. (ii) In (c) carbon atom is sp3 hybridised. (iii) In (c) carbon atom is sp2 hybridised. (iv) (a) and (e) both are electrophiles. Which of the following statements are correct about this reaction? (i) The given reaction follows SN2 mechanism. (ii) (b) and (d) have opposite configuration. (iii) (b) and (d) have same configuration. 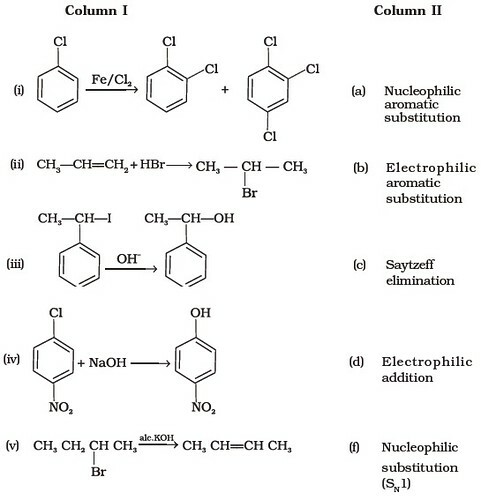 (iv) The given reaction follows SN1 mechanism. Which of the following statements are correct about the reaction intermediate? (i) Intermediate (c) is unstable because in this carbon is attached to 5 atoms. (ii) Intermediate (c) is unstable because carbon atom is sp2 hybridised. (iii) Intermediate (c) is stable because carbon atom is sp2 hybridised. (iv) Intermediate (c) is less stable than the reactant (b). Answer Q. No. 35 and 36 on the basis of the following reaction. Which of the following statements are correct about the mechanism of this reaction? (i) A carbocation will be formed as an intermediate in the reaction. (ii) OH– will attach the substrate (b) from one side and Cl– will leave it simultaneously from other side. (iii) An unstable intermediate will be formed in which OH– and Cl– will be attached by weak bonds. (iv) Reaction proceeds through SN1 mechanism. Which of the following statements are correct about the kinetics of this reaction? (i) The rate of reaction depends on the concentration of only (b). (ii) The rate of reaction depends on concentration of both (a) and (b). (iii) Molecularity of reaction is one. (iv) Molecularity of reaction is two. Haloalkanes contain halogen atom (s) attached to the sp3 hybridised carbon atom of an alkyl group. Identify haloalkane from the following compounds. Ethylene chloride and ethylidene chloride are isomers. Identify the correct statements. (i) Both the compounds form same product on treatment with alcoholic KOH. (ii) Both the compounds form same product on treatment with aq.NaOH. 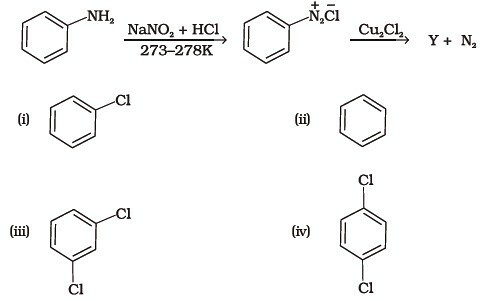 (iii) Both the compounds form same product on reduction. (iv) Both the compounds are optically active. Which of the following compounds are gem-dihalides? 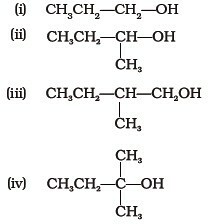 Which of the following are secondary bromides? Which of the following compounds can be classified as aryl halides? Alkyl fluorides are synthesised by heating an alkyl chloride/bromide in presence of ____________ or ____________. Aryl chlorides and bromides can be easily prepared by electrophilic substitution of arenes with chlorine and bromine respectively in the presence of Lewis acid catalysts. But why does preparation of aryl iodides requires presence of an oxidising agent? Out of o-and p-dibromobenzene which one has higher melting point and why? Which of the compounds will react faster in SN1 reaction with the –OH ion? Why iodoform has appreciable antiseptic property? Haloarenes are less reactive than haloalkanes and haloarenes. Explain. Discuss the role of Lewis acids in the preparation of aryl bromides and chlorides in the dark. Which of the following compounds (a) and (b) will not react with a mixture of NaBr and H2SO4. Explain why? Which of the products will be major product in the reaction given below? Explain. Why is the solubility of haloalkanes in water very low? Draw other resonance structures related to the following structure and find out whether the functional group present in the molecule is ortho, para directing or meta directing. Classify the following compounds as primary, secondary and tertiary halides. Compound ‘A’ with molecular formula C4H9Br is treated with aq. KOH solution. The rate of this reaction depends upon the concentration of the compound ‘A’ only. When another optically active isomer ‘B’ of this compound was treated with aq. KOH solution, the rate of reaction was found to be dependent on concentration of compound and KOH both. (i) Write down the structural formula of both compounds ‘A’ and ‘B’. (ii) Out of these two compounds, which one will be converted to the product with inverted configuration. Write the structures and names of the compounds formed when compound ‘A’ with molecular formula, C7H8 is treated with Cl2 in the presence of FeCl3. Which of the following compounds will have the highest melting point and why? Write down the structure and IUPAC name for neopentyl bromide. A hydrocarbon of molecular mass 72 g mol–1 gives a single monochloro derivative and two dichloro derivatives on photo chlorination. Give the structure of the hydrocarbon. Name the alkene which will yield 1-chloro-1-methylcyclohexane by its reaction with HCl. Write the reactions involved. Which of the following haloalkanes reacts with aqueous KOH most easily? Explain giving reason. Why can aryl halides not be prepared by reaction of phenol with HCl in the presence of ZnCl2? 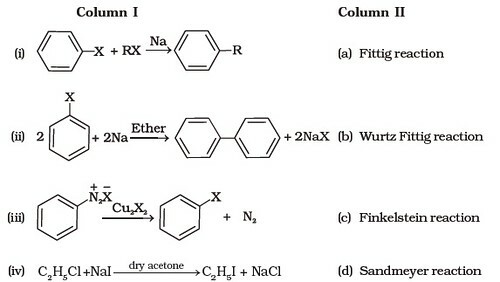 Which of the following compounds would undergo SN1 reaction faster and why? Allyl chloride is hydrolysed more readily than n-propyl chloride. Why? Why is it necessary to avoid even traces of moisture during the use of a Grignard reagent? How do polar solvents help in the first step in SN1 mechanism? Write a test to detect the presence of double bond in a molecule. Diphenyls are potential threat to the environment. How are these produced from aryl halides? What are the IUPAC names of the insecticide DDT and benzene hexachloride? Why is their use banned in India and other countries? Elimination reactions (especially β-elimination) are as common as the nucleophilic substitution reaction in case of alkyl halides. Specify the reagents used in both cases. How will you obtain monobromobenzene from aniline? tert-Butyl Bromide reacts with aq. NaOH by SN1 mechanism while n-butyl bromide reacts by SN2 mechanism. Why? Predict the major product formed when HCl is added to isobutylene. Explain the mechanism involved. Discuss the nature of C–X bond in the haloarenes. How can you obtain iodoethane from ethanol when no other iodine containing reagent except NaI is available in the laboratory? Note : Match the items given in Column I and Column II in the following questions. 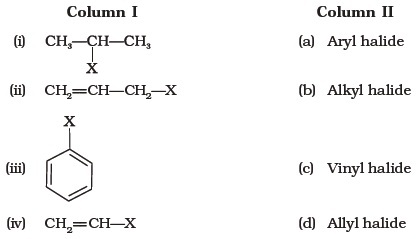 Match the the compounds given in Column I with the effects given in Column II. Match the items of Column I and Column II. Match the structures of compounds given in Column I with the classes of compounds given in Column II. Match the reactions given in Column I with the types of reactions given in Column II. Match the structures given in Column I with the names in Column II. Match the reactions given in Column I with the names given in Column II. Note : In the following questions a statement of assertion followed by a statement of reason is given. Choose the correct answer out of the following choices. (i) Assertion and reason both are correct and reason is correct explanation of assertion. (ii) Assertion and reason both are wrong statements. (iii) Assertion is correct but reason is wrong statement. (iv) Assertion is wrong but reason is correct statement. (v) Assertion and reason both are correct statements but reason is not correct explanation of assertion. Assertion : Phosphorus chlorides (tri and penta) are preferred over thionyl chloride for the preparation of alkyl chlorides from alcohols. Reason : Phosphorus chlorides give pure alkyl halides. Reason : The boiling points of alkyl chlorides, bromides and iodides are considerably higher than that of the hydrocarbon of comparable molecular mass. Reason : CN– is an ambident nucleophile. Assertion : tert-Butyl bromide undergoes Wurtz reaction to give 2, 2, 3, 3-tetramethylbutane. Reason : In Wurtz reaction, alkyl halides react with sodium in dry ether to give hydrocarbon containing double the number of carbon atoms present in the halide. Assertion : Presence of a nitro group at ortho or para position increases the reactivity of haloarenes towards nucleophilic substitution. Reason : Nitro group, being an electron withdrawing group decreases the electron density over the benzene ring. Assertion : In mono haloarenes, further electrophilic substitution occurs at ortho and para positions. Reason : Halogen atom is a ring deactivator. Assertion : Aryl iodides can be prepared by reaction of arenes with iodine in the presence of an oxidising agent. Reason : Oxidising agent oxidises I2 into HI. Assertion : It is difficult to replace chlorine by –OH in chlorobenzene in comparison to that in chloroethane. Reason : Chlorine-carbon (C—Cl) bond in chlorobenzene has a partial double bond character due to resonance. Assertion : Hydrolysis of (–)-2-bromooctane proceeds with inversion of configuration. Reason : This reaction proceeds through the formation of a carbocation. Reason : —NO2 group is a m-directing group. Some alkyl halides undergo substitution whereas some undergo elimination reaction on treatment with bases. Discuss the structural features of alkyl halides with the help of examples which are responsible for this difference. Some halogen containing compounds are useful in daily life. Some compounds of this class are responsible for exposure of flora and fauna to more and more of UV light which causes destruction to a great extent. Name the class of these halo compounds. In your opinion, what should be done to minimise harmful effects of these compounds. Why are aryl halides less reactive towards nucleophilic substitution reactions than alkyl halides? How can we enhance the reactivity of aryl halides?